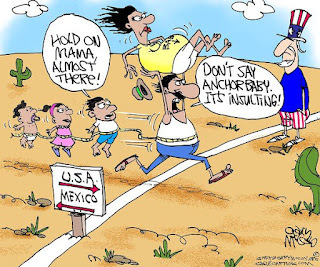 I’ve stated for years that our nation should eliminate the loophole allowing this easy means of instant citizenship to those who ‘drop’ babies on our borders. In recent decades that has come to include Chinese, Russian and Hispanic women as shown on a 60 Minutes special…it also provides an all too easy means to grab welfare benefits [which should be changed to a waiting time of at least six months]. [We should also stop subsidizing multiple out-of-wedlock births to the same mother…one is a mistake, two or more is a lifestyle and taxpayers should not pay for that]. President Donald Trump threw another hand grenade into the illegal immigration debate when he proposed this week that he can end "birthright citizenship" with an executive order. 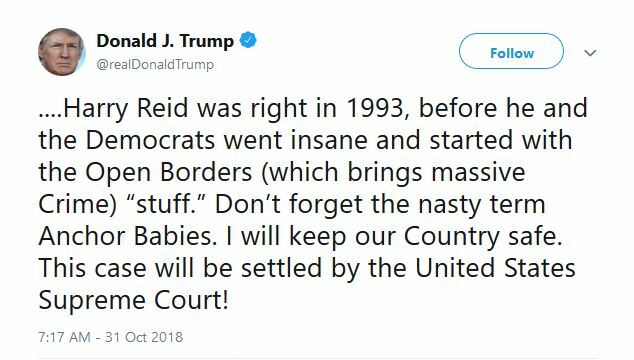 It's not the first time Trump has weighed in on the anchor baby issue, having said in 2015 the practice needs be halted and that an act of Congress would accomplish it. Nor is Trump the only one who's ever proposed such a thing. Representative Steve King (R-Iowa) introduced legislation in the House to end the practice in 2011, 2013 and 2015. Former Democrat Senator Harry Reid (Corrupt–Nevada) introduced the Immigration Stabilization Act of 1993. History has shown that a feckless Congress beholden to its corporate and union masters has no interest in addressing immigration laws. Trump knows this. Mainstream legal scholars — also known as "constitutional scholars" in the mainstream propaganda media, implying that scholars who hold an opposing view are not "constitutional scholars" — hold that everyone born in the U.S. is "subject to the jurisdiction thereof," and are, therefore, citizens at birth. But that's not what the 14th Amendment's framers had in mind. A little history. The 14th Amendment was proposed to combat laws called "Black Codes" that regulated behavior of newly freed black slaves following the War of Northern Aggression. The codes were first implemented by the Union Army occupying the former Confederate States. [P]rovides for the equality of citizens of the United States in the enjoyment of "civil rights and immunities." What do these terms mean? Do they mean that in all things civil, social, political, all citizens, without distinction of race or color, shall be equal? By no means can they be so construed. Do they mean that all citizens shall vote in the several States? No; for suffrage is a political right which has been left under the control of the several States, subject to the action of Congress only when it becomes necessary to enforce the guarantee of a republican form of government (protection against a monarchy). Nor do they mean that all citizens shall sit on the juries, or that their children shall attend the same schools. The definition given to the term "civil rights" in Bouvier's Law Dictionary is very concise, and is supported by the best authority. It is this: "Civil rights are those which have no relation to the establishment, support, or management of government." It's inconceivable that the same group of men that passed a law in Congress that excludes citizenship to people subject to a foreign power, and then overrode a presidential veto on that bill, would turn around and pass an amendment to ensure the act remained in force that granted citizenship status to people "subject to any foreign power." Congress suspected the Civil Rights Act could be overturned or rendered unconstitutional, so lawmakers drafted the 14th Amendment in order to prevent its repeal and to give it the support of constitutional footing. But the 14th Amendment was never lawfully ratified. I find no fault with the introductory clause, which is simply declaratory of what is written in the Constitution, that every human being born within the jurisdiction of the United States of parents not owing allegiance to any foreign sovereignty is, in the language of your Constitution itself, a natural born citizen. [T]his amendment which I have offered is simply declaratory of what I regard as the law of the land already, that every person born within the limits of the United States, and subject to their jurisdiction, is by virtue of natural law and national law a citizen of the United States. This will not, of course, include persons born in the United States who are foreigners, aliens, who belong to the families of ambassadors or foreign ministers accredited to the Government of the United States, but will include every other class of persons. It settles the great question of citizenship and removes all doubt as to what persons are or are not citizens of the United States. This has long been a great desideratum in the jurisprudence and legislation of this country. This echoed the sentiments of the Founding Fathers who, though living in a new nation with a population consisting mostly of recent immigrants, recognized the danger of too many aliens arriving at once without the desire to assimilate into the "spirit" of the new country. "[Emigrants] will bring with them the principles of governments they leave, imbibed in their early youth;" Thomas Jefferson wrote in his "Notes on the State of Virginia," "or, if able to throw off, it will be in exchange for unbounded licentiousness, passing, as is usual, from one extreme to the other. It would be a miracle if they were to stop precisely at the point of temperate liberty." And writing "an Examination of the President's Message" in 1802 for the New York Evening Post, Alexander Hamilton posited that, "Some reasonable term ought to be allowed to enable aliens to get rid of foreign and acquire American attachments; to learn the principles and imbibe the spirit of our government; and to admit of a probability at least, of their feeling a real interest in our affairs." I strongly oppose rule by executive order, which is an unconstitutional power grab over congress and running precedent for an imperial presidency. But this seems more an effort at nullifying unconstitutional edicts of the federal courts than a power grab. After John Adams signed legislation that made it a treasonable activity to publish "any false, scandalous and malicious writing" which became the Alien and Sedition Acts, Jefferson and James Madison drafted Kentucky Resolutions and Resolutions for Virginia that essentially said that when the Federal government assumes undelegated powers — those not enumerated in the Constitution — those acts are "unauthoritative, void, and of no force." These came to be known as the Principals of '98. There is no position which depends on clearer principles, than that every act of a delegated authority contrary to the tenor of the commission under which it is exercised, is void. No legislative act, therefore, contrary to the constitution, can be valid." 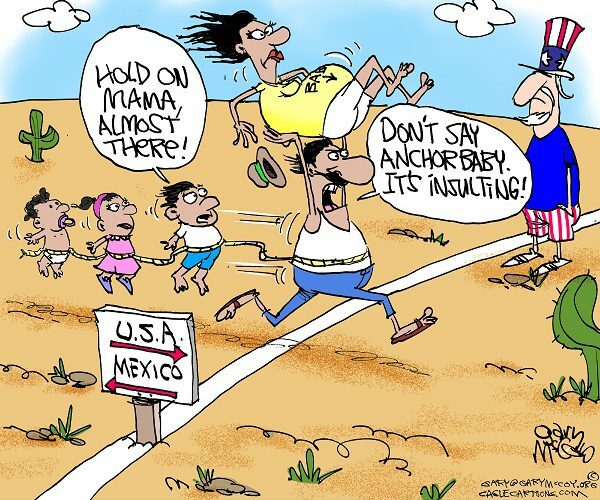 If Trump does sign an executive order to end the practice of anchor baby citizenship, his goal may be to get the issue before the Supreme Court so it can become "settle law." At least that seems to be the case given one of his latest tweets on the subject. 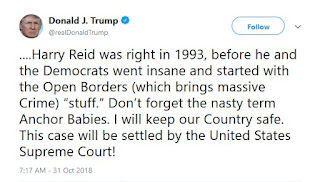 The Supreme Court has never ruled on a case specifically dealing with the birthright citizenship issue, despite what the mainstream pundits and leftist echo chamber have claimed. 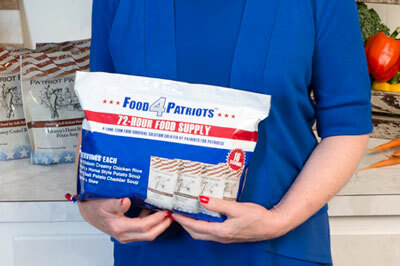 More Americans than ever are becoming dependent on the government just to survive. Today, we live in a country where most workers do not earn enough to support a middle class family, and we are seeing the homelessness crisis spiral out of control in major cities on both coasts. Over half the country now receives more in government transfer payments than they pay in taxes. 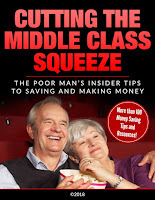 -According to one recent survey, the cost of living is higher than the median income in 42 U.S. states. State governments in particular keep raising fees and taxes as they are overextended and are passing costs on to taxpayers. Many families do not know the basics of managing their finances and credit card debt is once again spiraling to levels not seen since the economic collapse of 2009. Wealth is even less equally distributed, with just three Americans having as much as the bottom 50 percent—testimony to how much money there is at the top and how little there is at the bottom. Families in the bottom 50 percent hardly have the cash reserves to meet an emergency. Newspapers are replete with stories of those for whom the breakdown of a car or an illness starts a downward spiral from which they never recover. I live in a border state & see how this system is abused all the time & it angers me that Congress does nothing. There are organized groups of Hispanics here which walk illegals through the system showing them how to get all kinds of free welfare goodies-it is infuriating to see my tax dollars being pissed away. Once a court looks at the meaning of the 14th Amendment, the plain meaning of the Amendment would likely prevail and I would be inclined to that view. However, it is wrong to dismiss alternative interpretations as frivolous or bad faith. This is a long standing debate. The Amendment itself was designed to address a different issue: guaranteeing the full rights of citizenship for free slaves after the Civil War. The status of the children of undocumented immigrants was simply not the focus… illegal immigration was not a primary concern during the period. I am among those who feel we should stop being so generous with welfare dollars to illegals-cut off those dollars and see what happens [Democrats would never cut off benefits in the 'land of milk n honey to those potential voters]...why should taxpayers support them and as pointed out here, why should we support the lifestyle of those who multiple illigitimate kids to multiple fathers? Does GM's Restructuring Equal Economic Panic?